The choice of Valencia was quite surprising as the launch track. It’s a fairly tight technical track, maybe better suited to 600s than litre bikes. 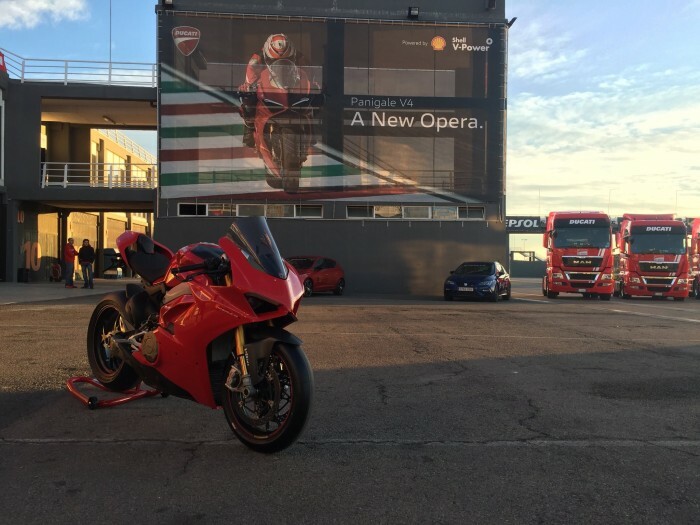 And the new V4 is actually an 1100… Ducati says they chose this capacity to give the bike a torquey delivery like the big V-twins, rather than a peakier four-cylinder feel. That, plus the ‘Twin pulse’ layout (it’s like two 360° parallel twins arranged at 90° to each other) gives it a very ‘twin-ish’ sound and feel. Imagine the crossplane crank R1 and you’re somewhere near. So – a 214bhp 1100 V-4, at a tight and twisty track – how does it do? Really well is the obvious answer. Ducati’s done a great job to make this monster of a bike feel really manageable, light and easy to turn. Part of that is the electronics of course - and it’s great to have the advanced traction control and ABS ready to step in should you need it. But the basic bike is very friendly, and in the early sessions here, I quickly got myself up to speed with the track. Brakes are predictably awesome, the new Brembo Stylema calipers and 330mm discs hauling you down from 280kph-ish with supreme ease.